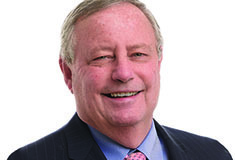 Shown above (from left) are: Bruce Berg, Cappelli Org. ; Rob Dirks, principal Real Estate Investors; city manager Chuck Strome; mayor Noam Bramson; Louis Cappelli, Cappelli Organization; planning commissioner Luiz Aragon; and district 3 councilman Jared Rice. NEW ROCHELLE, NY Executives of the Cappelli Org. 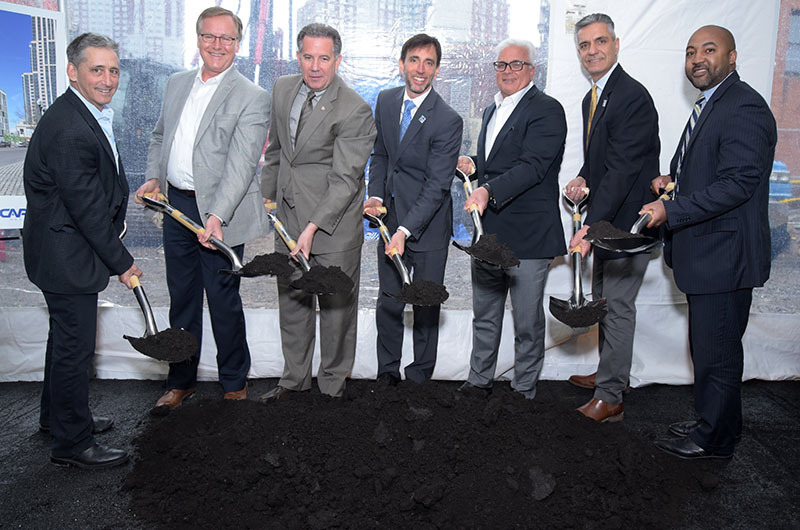 joined with city officials on April 25th for the groundbreaking of The Standard, a new 14-story residential building located on the site of the former Standard Star newspaper building in the downtown area. The team for the $20 million project includes: Design Development Group as the architect and Fuller Marquise, LLC as the contractor. The building site spans the block between 251 North Ave. and LeCount Place. The new building will feature 112 apartments and 4,000 s/f of ground-level retail space. The apartments, which range from 440 to 755 s/f, will be comprised of 13 studios, 92 one-bedroom and seven two-bedroom units. The Standard will offer a combination of amenities and easy access to mass transit that is very appealing to Millennials, a driving force in today’s rental market. Amenities will include a rooftop deck with kitchen and cooking area; fitness center; business center/meeting/conference room; package concierge; virtual doorman; and a lounge with full kitchen, dining area, pool table and TV sets. There will also be an outdoor seating area with a fire pit on the ground floor located just off the community room. A storage area will be provided for bikes. Parking will be available in the adjacent New Roc City garage. The Standard is a five-minute walk from the Metro-North train station as well as the downtown’s many restaurants and retail stores. Built in 1924, the Neo-Classical style building housed the operations of the Standard Star daily newspaper which left the building in 1975. The back portion that housed the printing presses will be demolished while the North Avenue façade will be preserved and incorporated into the new building. The project is expected to be completed in the fourth quarter of 2019. 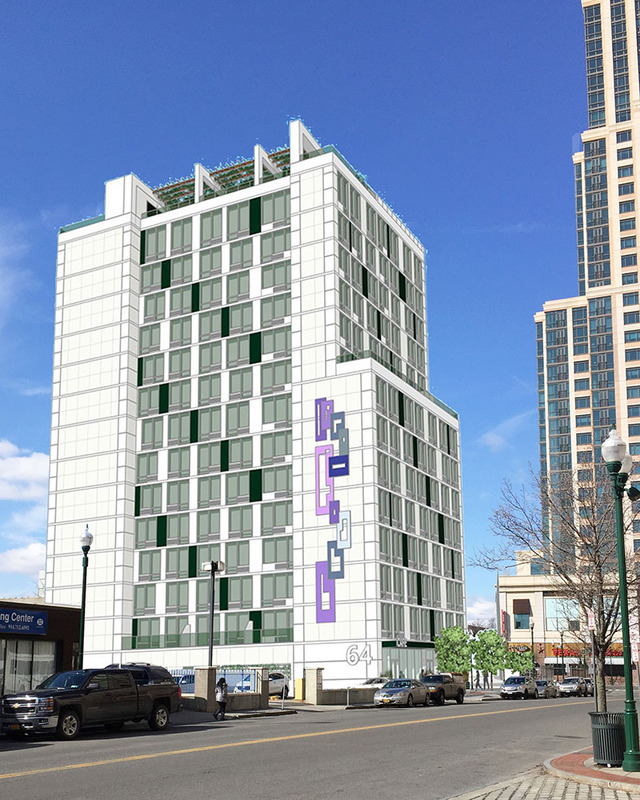 The start of the construction of The Standard marks a new strategy for the Cappelli Organization in New Rochelle to develop smaller rental units targeted to Millennials. Cappelli played a pivotal role in beginning the reimagination and revitalization of the City’s downtown. Over a 10-year period from 1997-2007, the company built approximately two million square feet of residential, entertainment, hotel, retail and garage properties. The signature projects include New Roc City, a 500,000 s/f entertainment center with a movie theater as well as a 70,000 s/f Stop and Shop, The Lofts at New Roc, a 125-room Marriott Residence Inn and the 40-story, 194-unit Trump Plaza Condominium tower which includes a 140,000 s/f retail center. “Today’s groundbreaking for The Standard marks yet another important step toward achieving our community’s vision of a walkable, vibrant, and diverse downtown that honors its history while embracing its future,” said New Rochelle Mayor Noam Bramson.